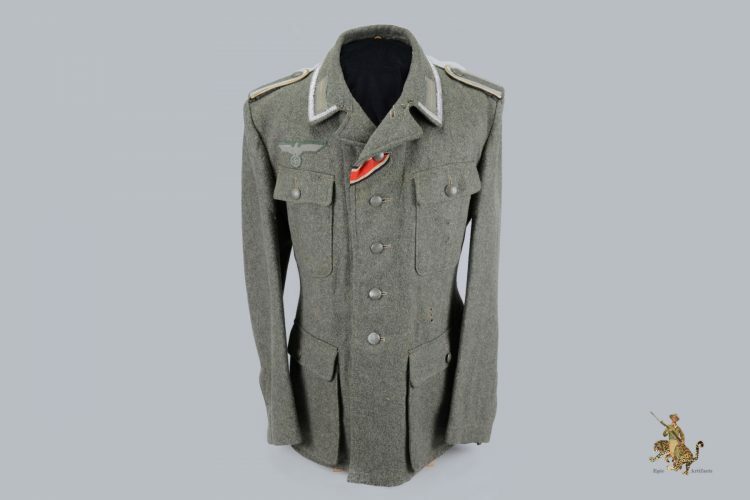 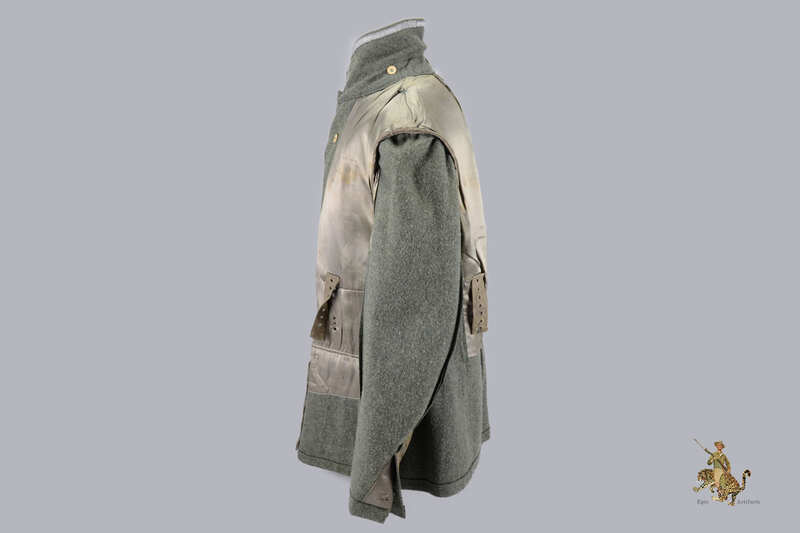 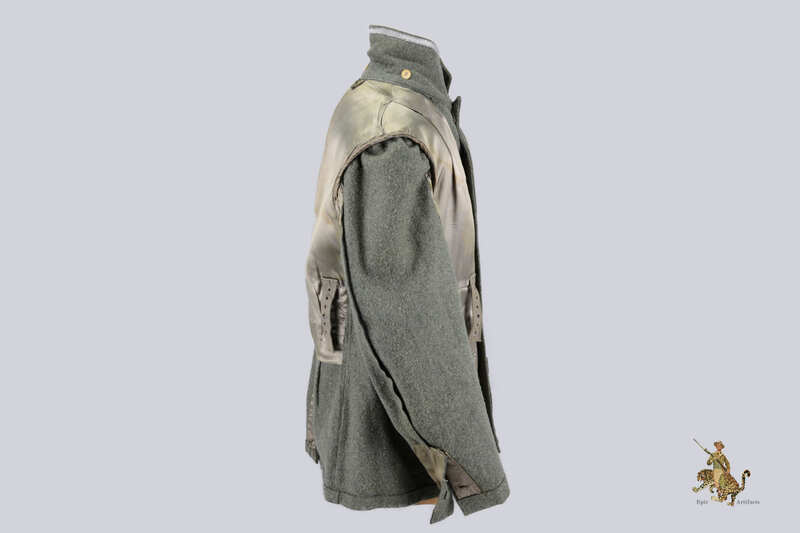 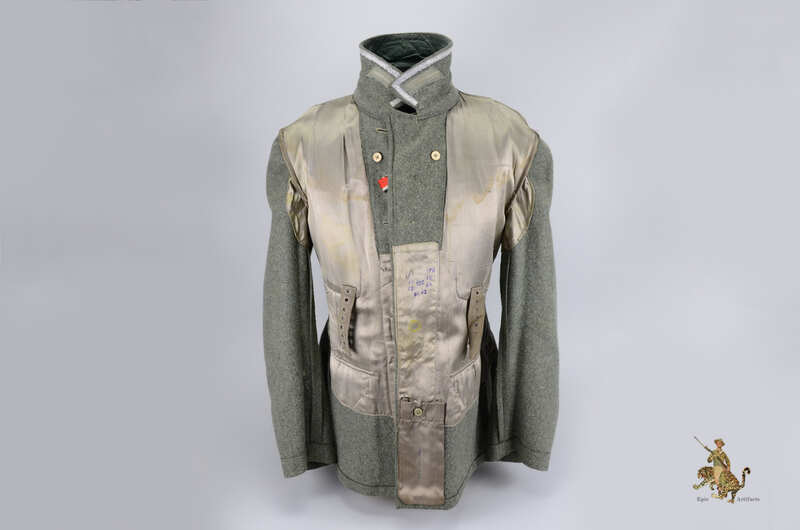 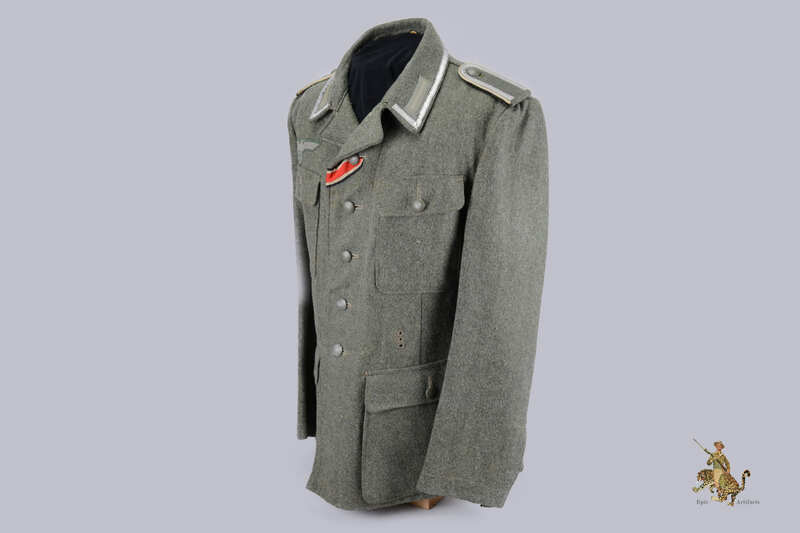 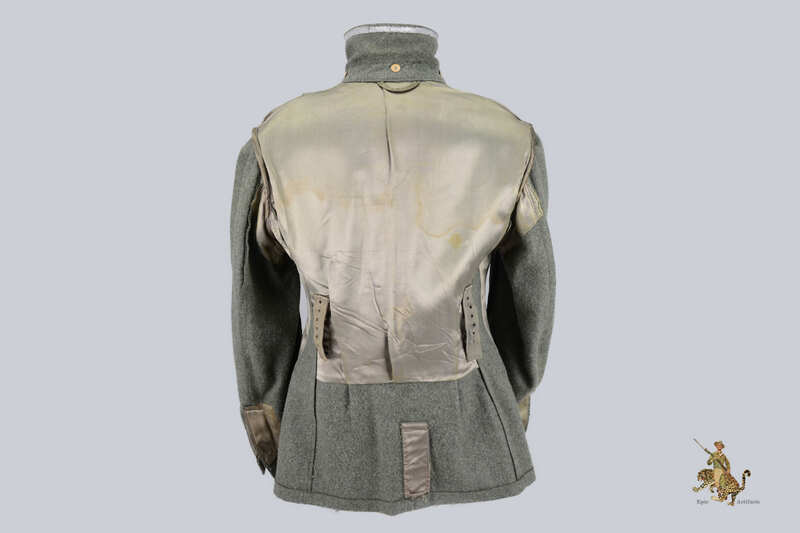 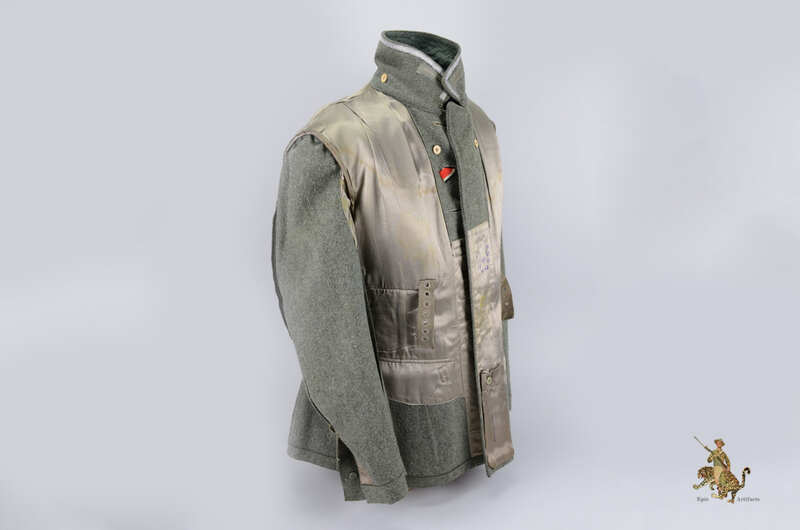 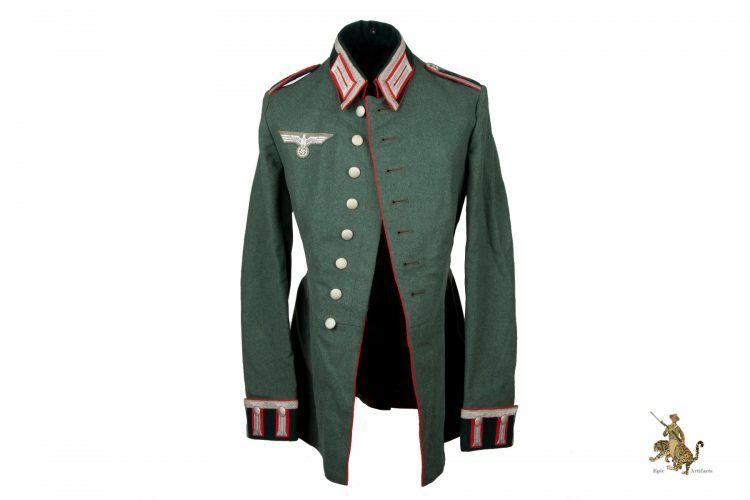 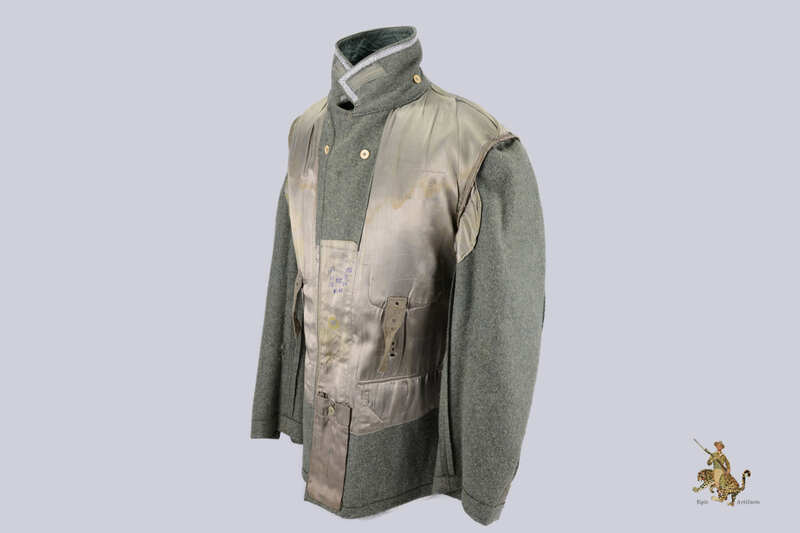 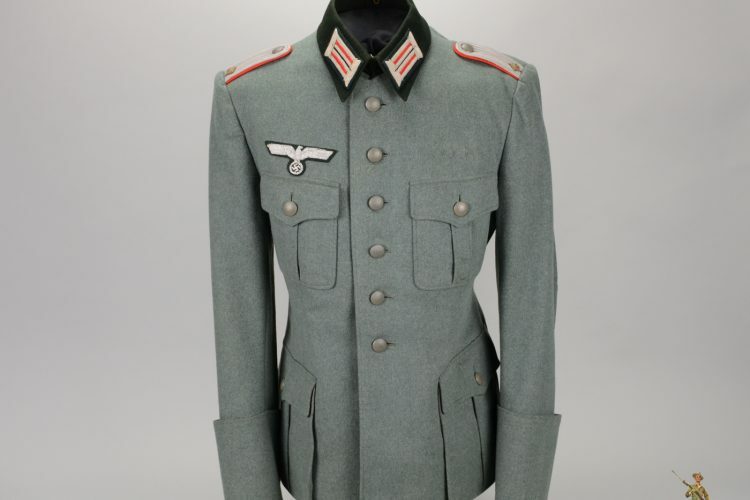 Product Description: Keyword: A Heer M43 NCO Tunic in excellent condition. 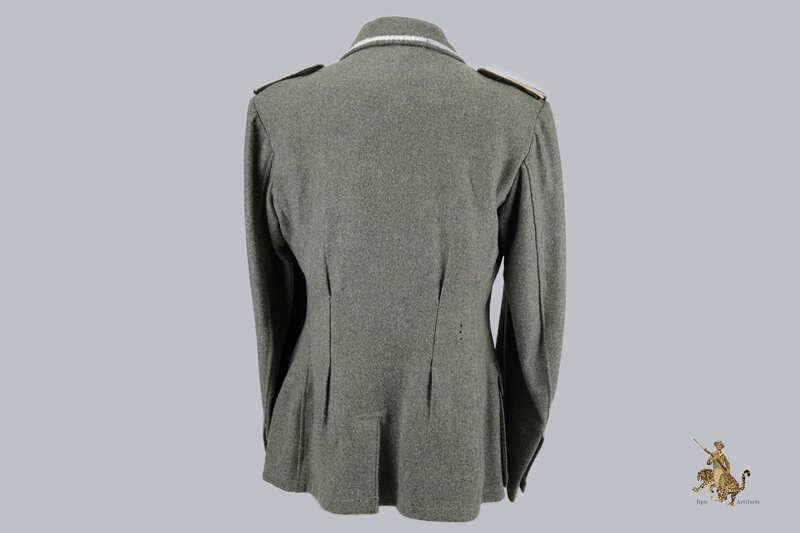 The base of the tunic is constructed of a fine feldgrau wool. 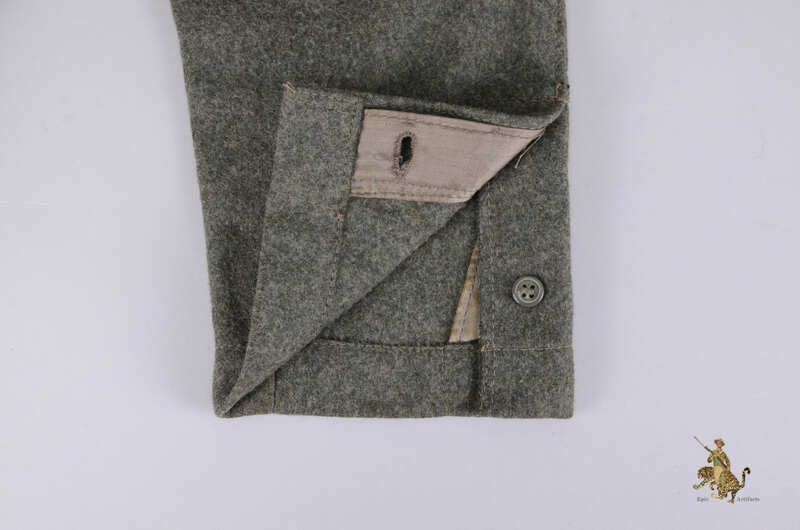 Four pockets adorn the front, with each pocket flap being the simple straight cut and fastened with painted pebbled zinc dish buttons. 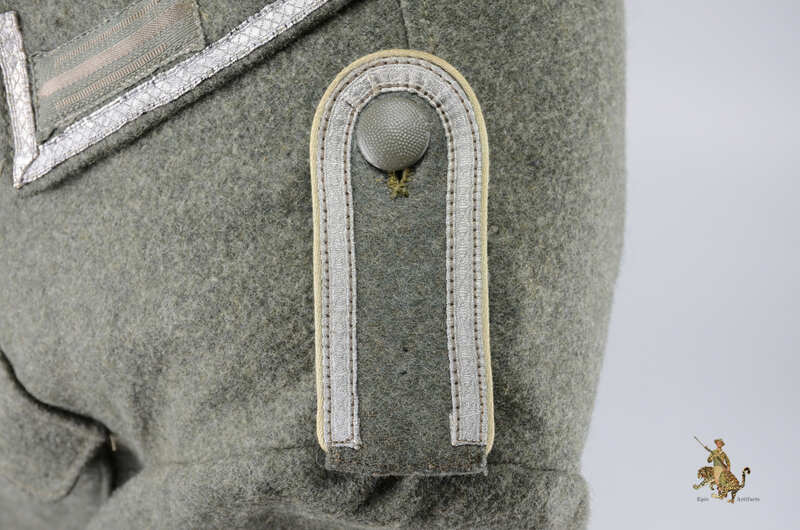 The tunics upper left breast pockets carries one set of award loops which appear to have been on he tunic for a length of time. 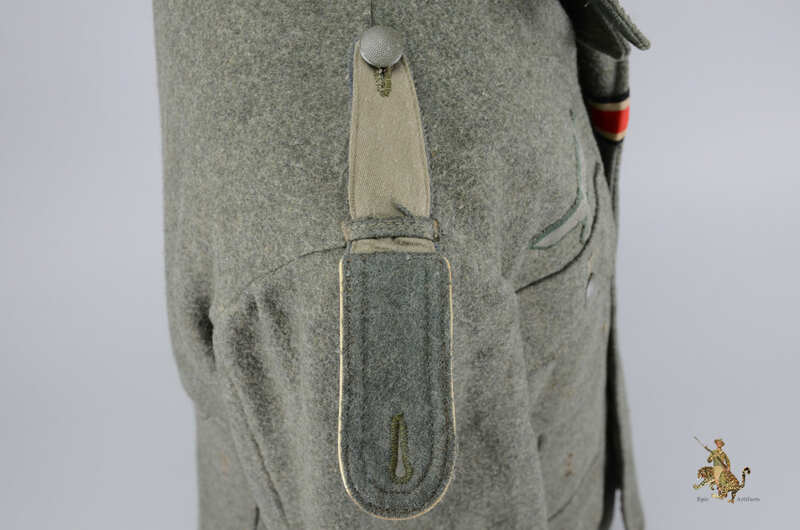 The standard Bevo EM collar litzen are machine sewn in place, and appear to be original to the tunic. 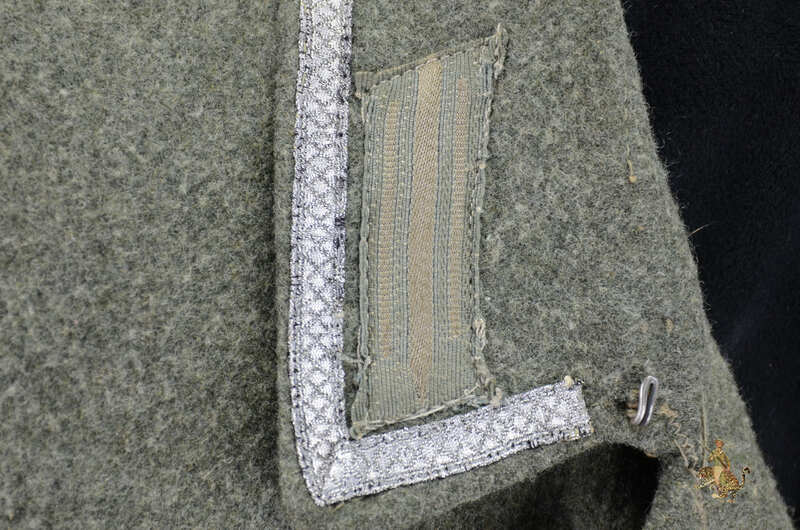 The collar features a strip of silvered tress, indicating the wearer of this tunic was an NCO. 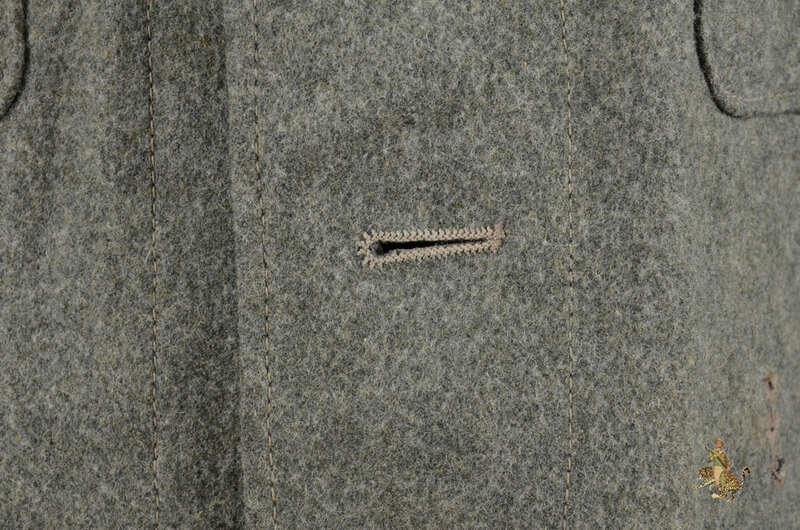 The collar tress is neatly hand sewn in place. The slip-on style shoulder boards are in near mint condition and feature the same style of silvered tress found on the collar. 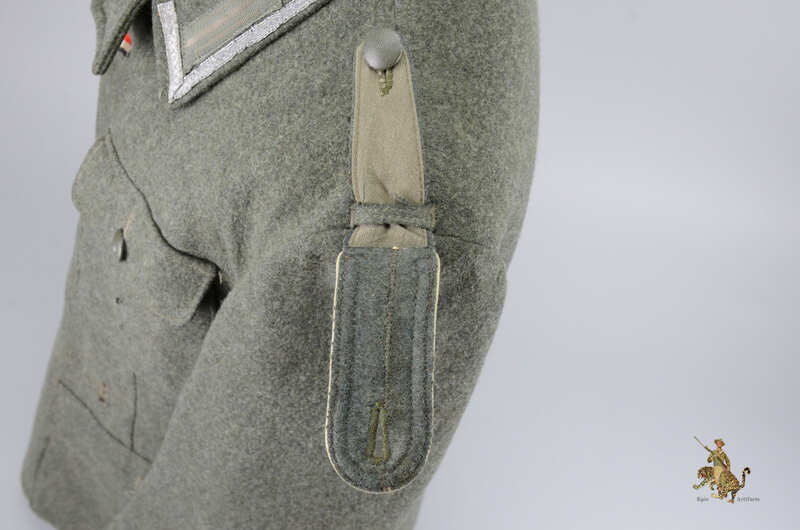 The silver tress was left open at the base of the shoulder board indicating the soldiers rank as “Unteroffizier”. 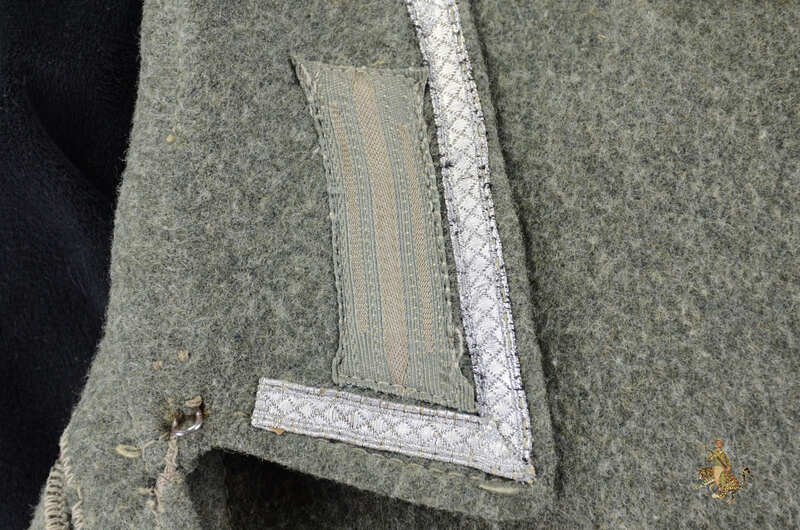 The edges of the boards are trimmed with a white piping, indicating the soldier was in the Infantry. 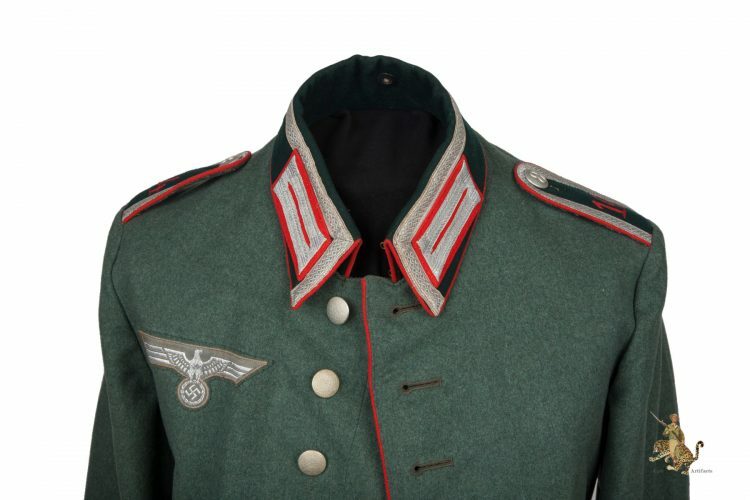 The Bevo style Heer breast eagle is in excellent condition, but has been reapplied to the tunic. 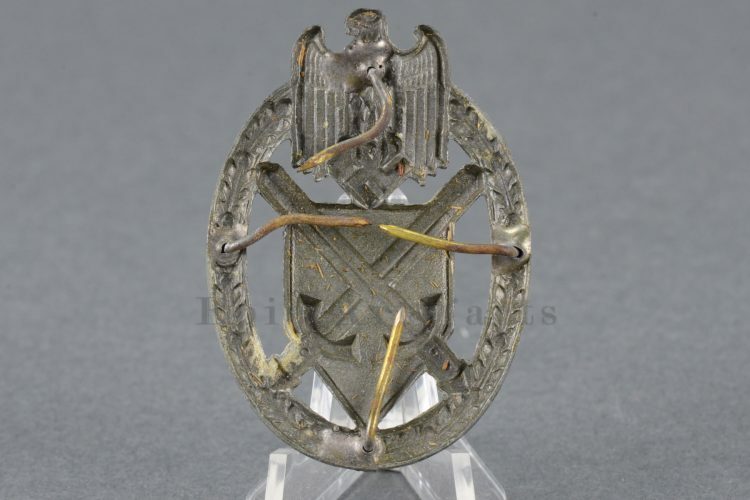 It is most likely that the original eagle was removed at the end of the war possibly by the wearer or another individual. 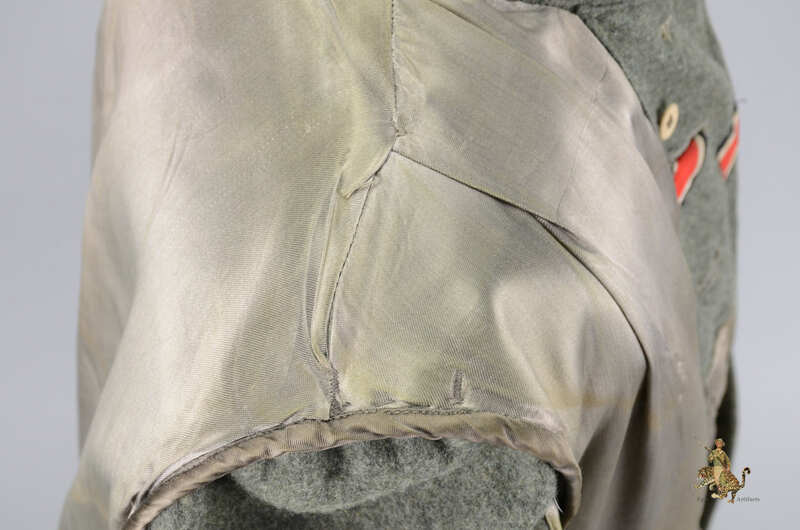 The breast eagle has been reattached to the tunic by means of hand stitching, some stitches have penetrated the interior artificial silk lining. 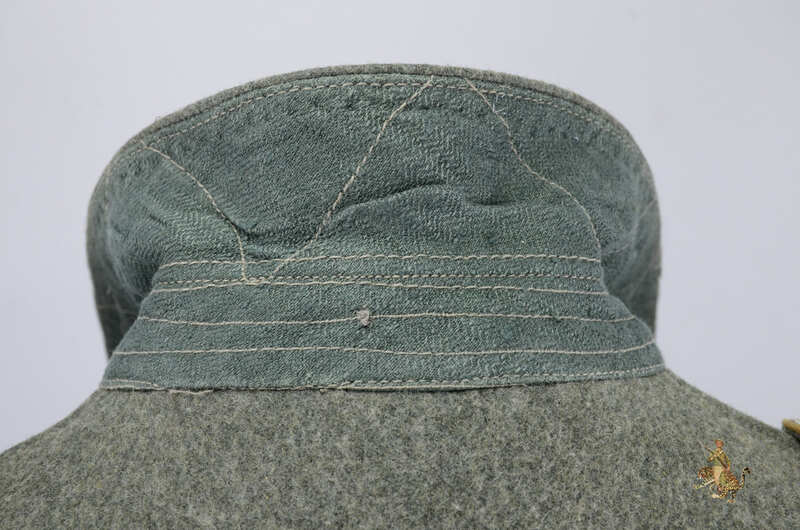 The pocket and main closure pebbled dish buttons are green painted zinc and are in excellent condition with a few scattered marks from use. 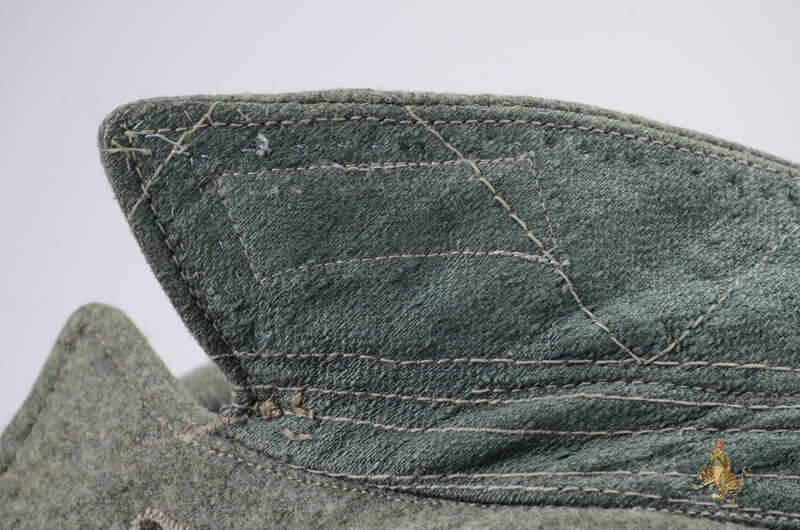 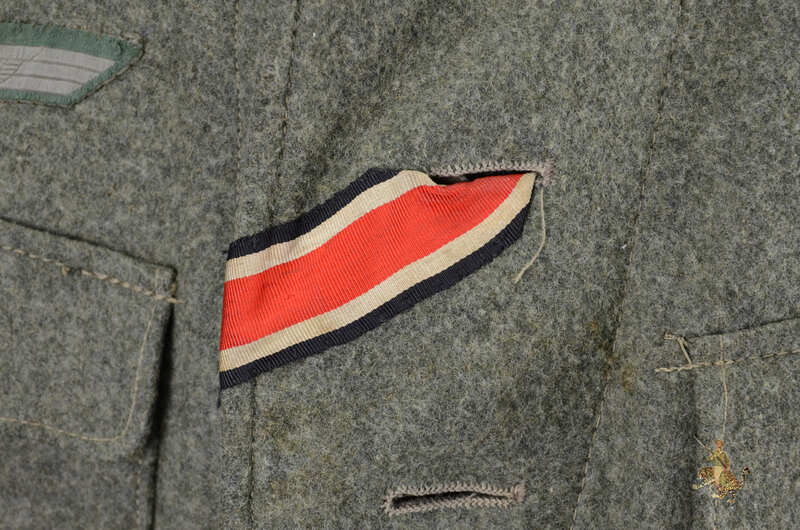 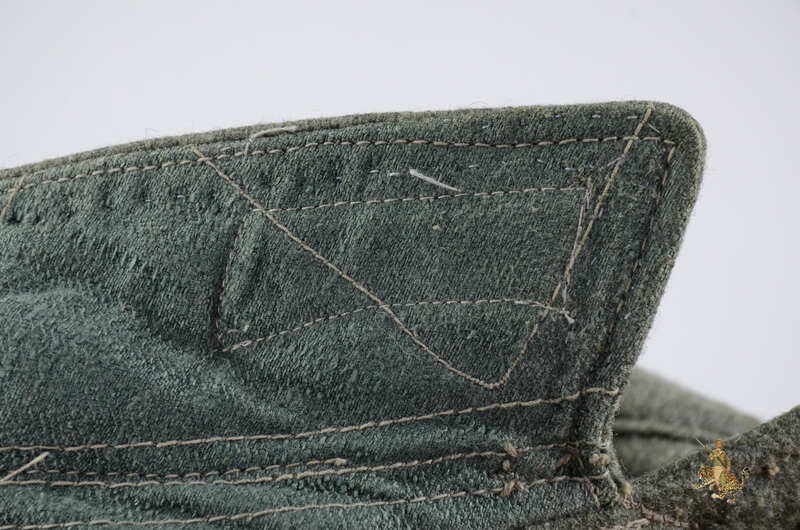 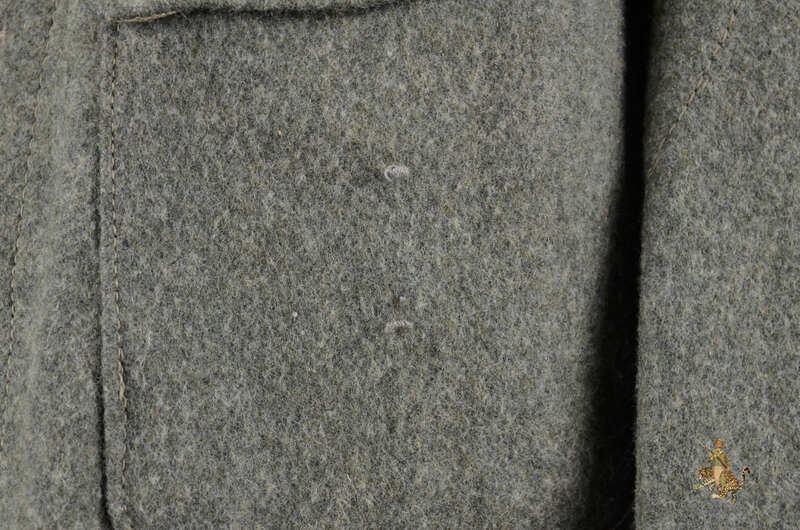 An Iron Cross Second Class Ribbon has been neatly hand sewn through the second button hole and shows light wear consistent with the tunic. 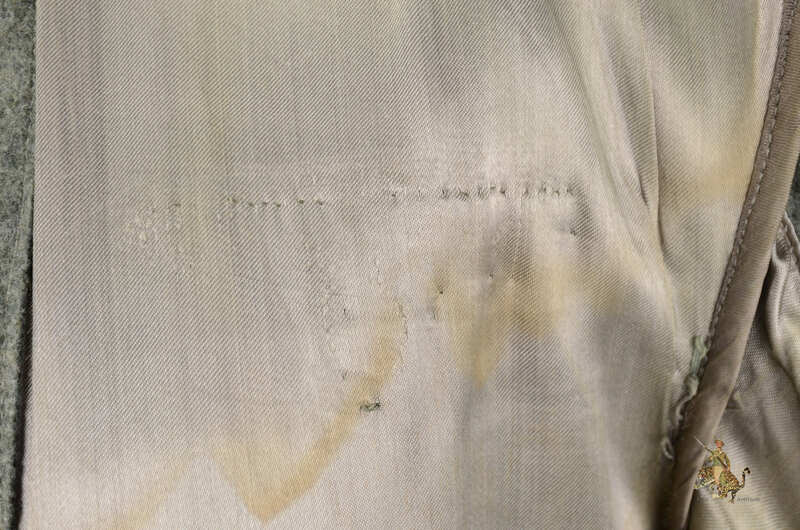 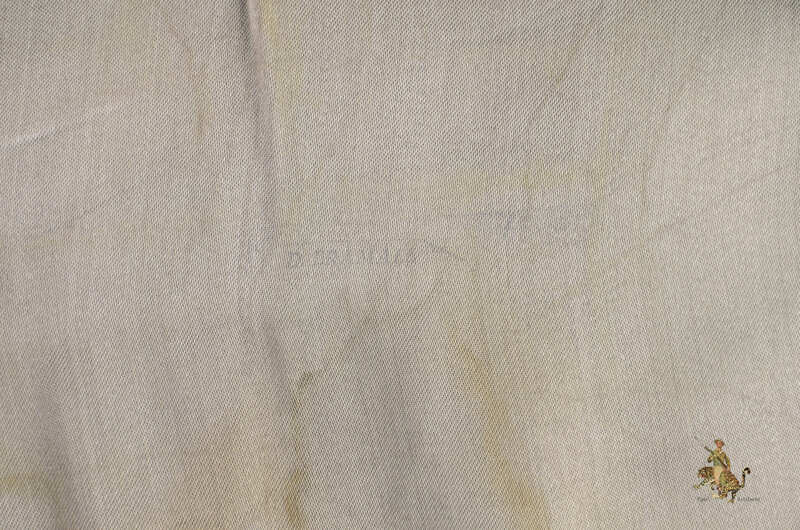 The interior of the tunic is lined in an artificial silk which is in overall excellent condition showing only a few areas of sweat staining. 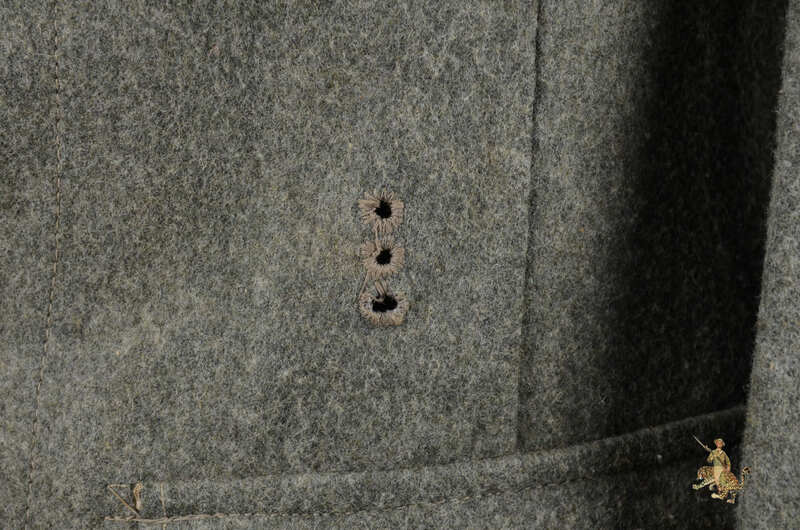 Four original pressed paper collar liner buttons are present and appear originally attached. 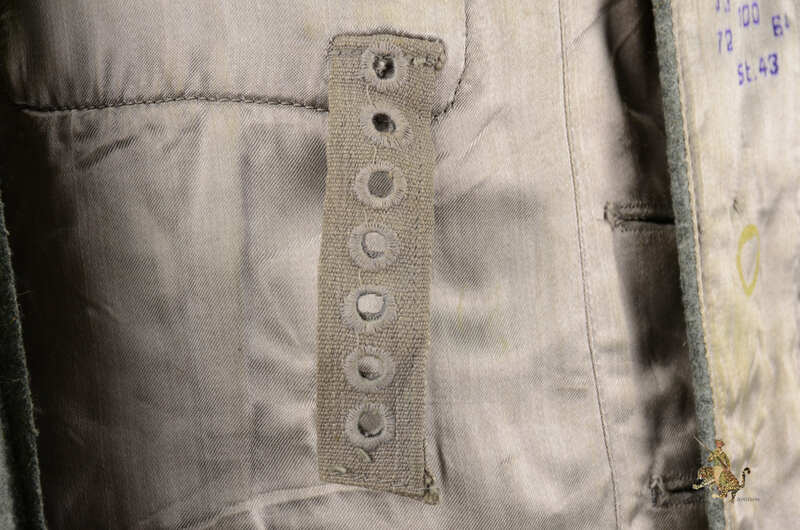 The interior has four belt hook adjustment straps which are in excellent condition. 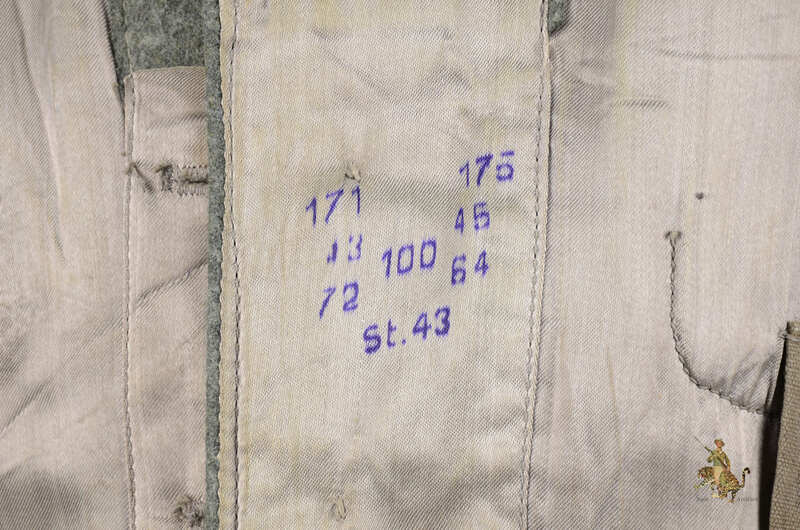 The interior of the tunic is ink stamped above the the medical pouch pocket with the tunics sizing, depot code (ST), and year(43). 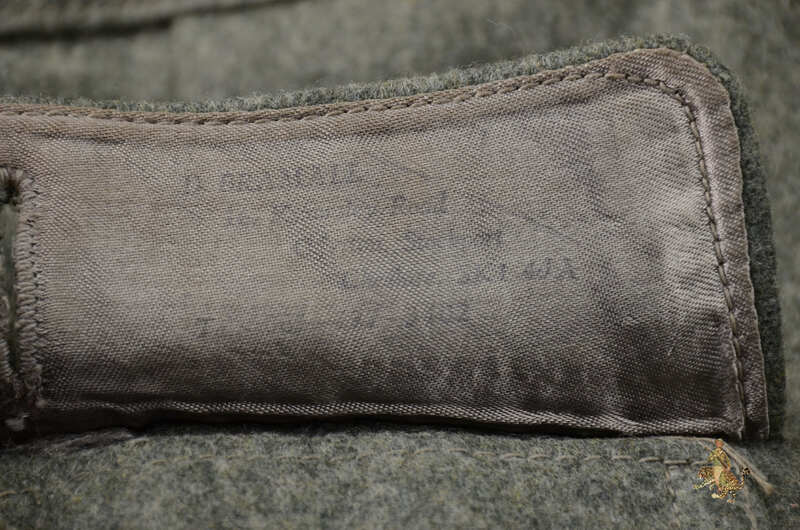 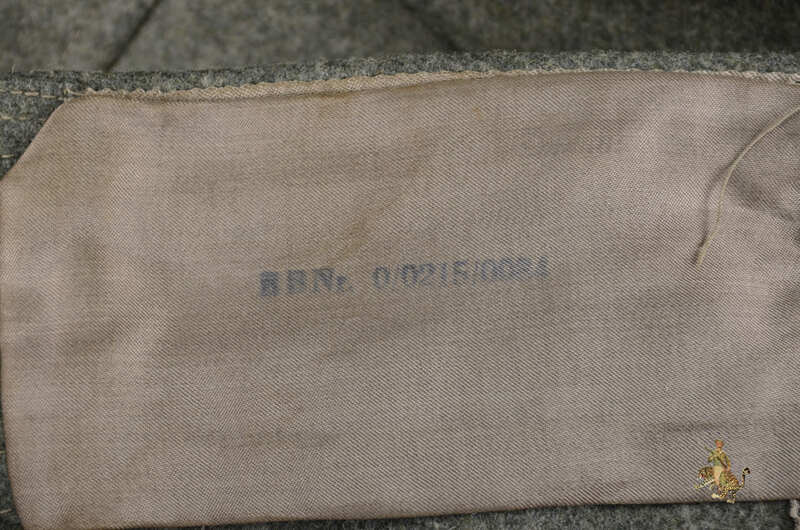 An RB number is stamped on the medical pouch pocket which reads “RBNr.0/0215/0084”. 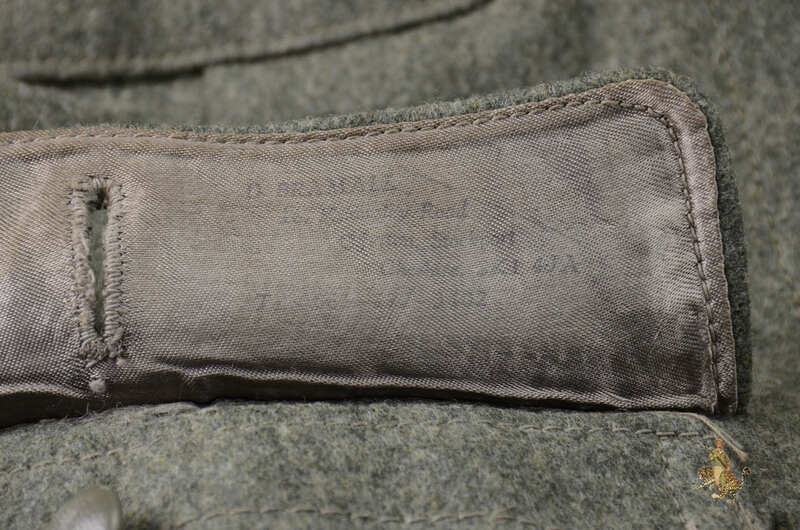 Upon close inspection a school stamp was found under the lower front pocket for a school located in England. 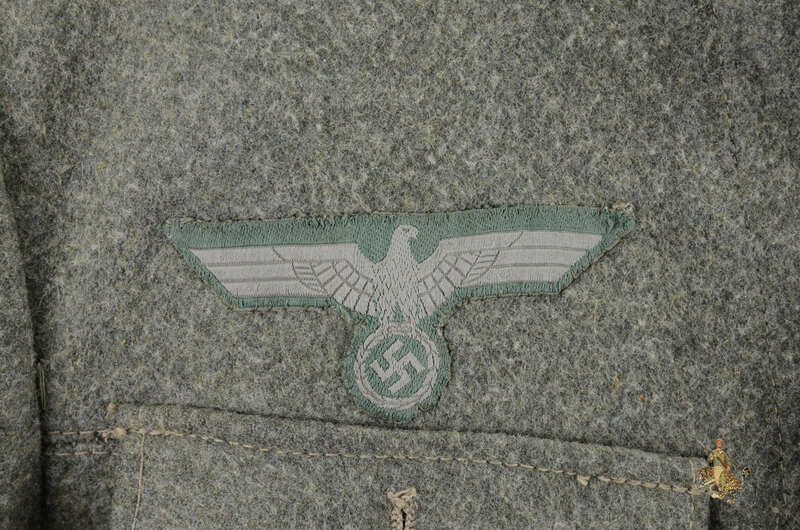 A google search was able to identify the school and its address. 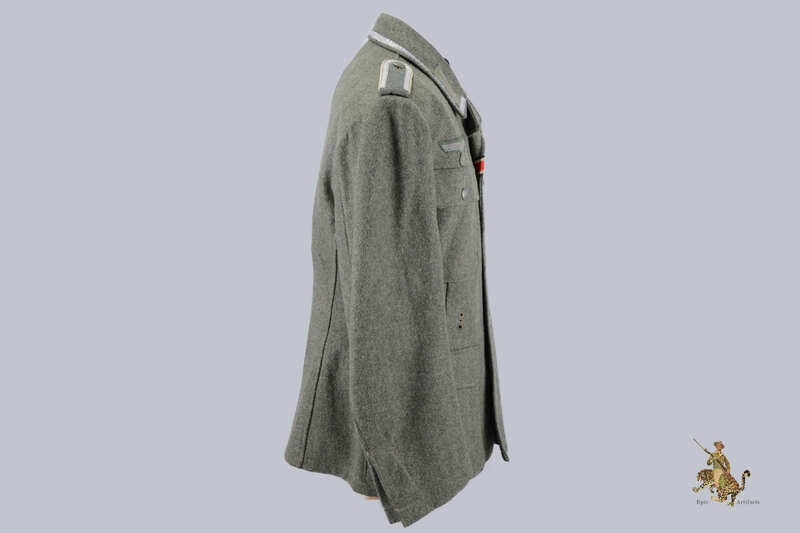 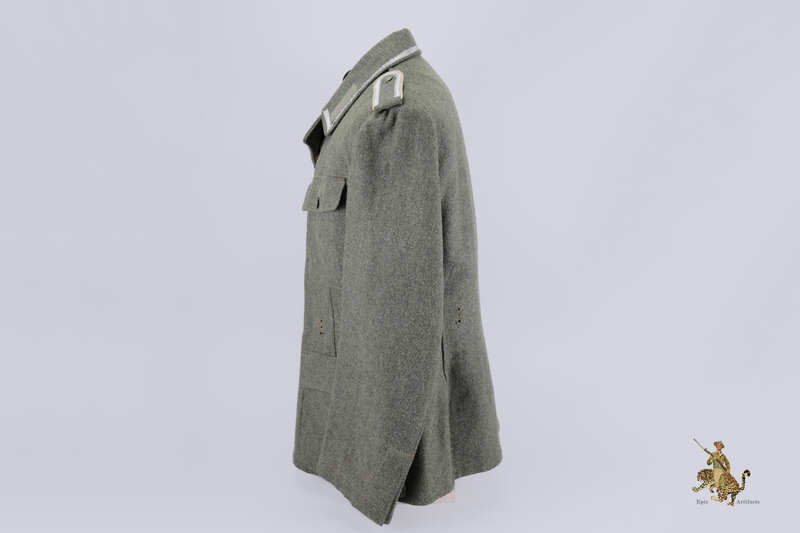 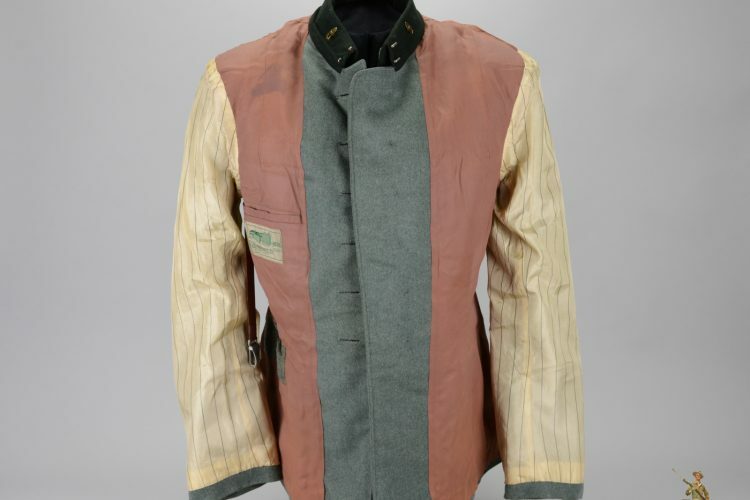 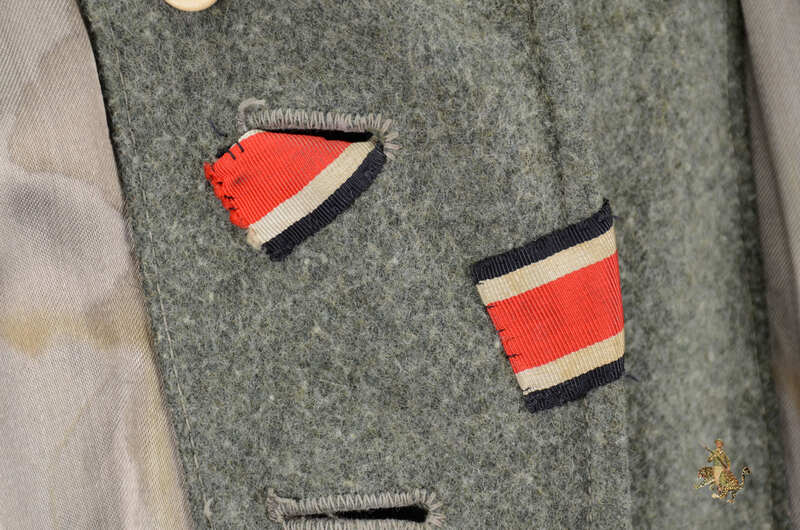 This tunic was most likely used as a costume prop for the school after the war. 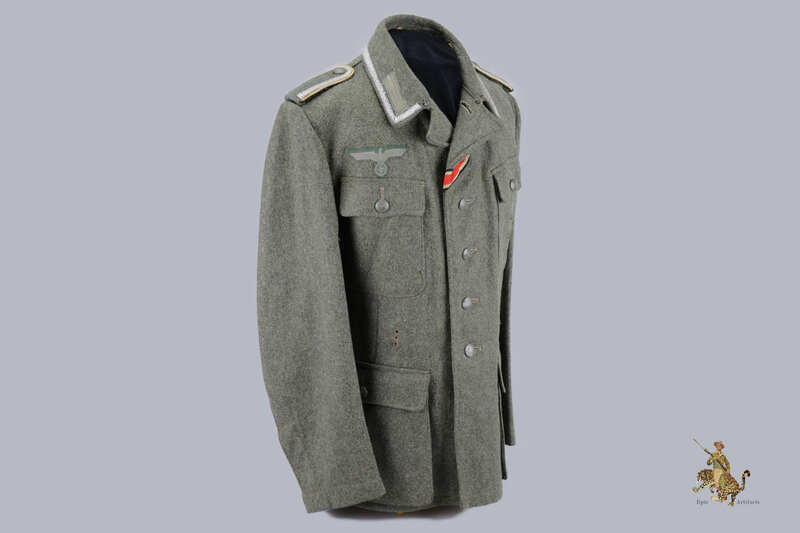 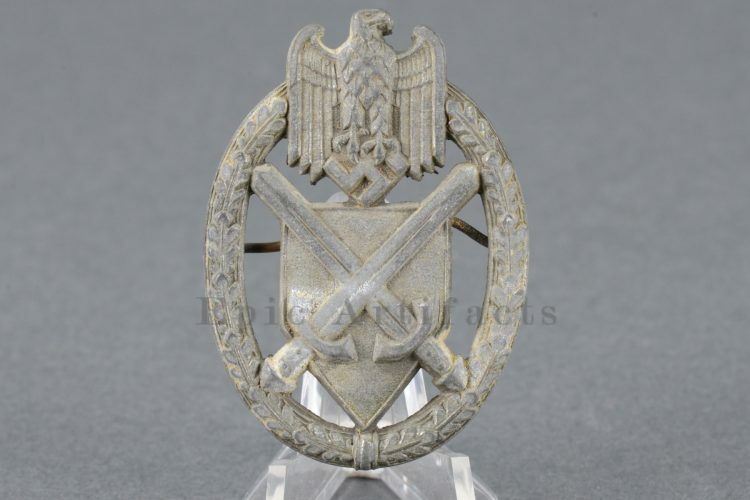 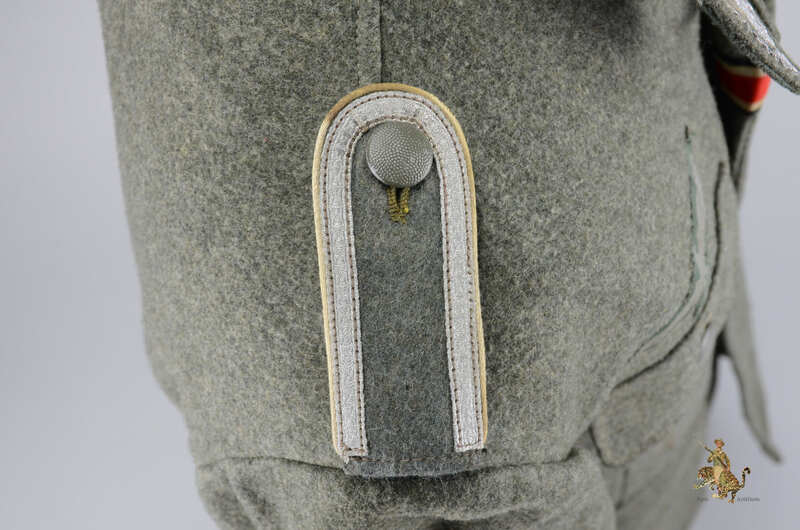 This is a very nice representative of the classic German Heer M43 NCO Tunic.